CD for flute and harp; flute and guitar; solo flute; and flute, violin, viola, cello. 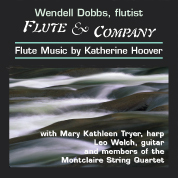 Wendell Dobbs, flute; with assisting artists Mary Kathleen Tryer, harp; members of the Montclaire String Quartet; and Leo Welch, guitar. Leonarda CD #LE349. Duration 59:36. Production: Recorded in Huntington, West Virginia 1995-1998. Sound recordist and first edit: Denny Chandler. Producer at recording sessions: Katherine Hoover (except Winter Spirits). Assistant producers at recordings: Paul A. Balshaw and Linda M. Dobbs. Post Production: Final edits and mastering: Marnie Hall, Leonarda Productions (New York City) and Jonathan Marcus, Orpharion Recordings (Long Beach, CA). DDD. Cover Photo: Williams River photo courtesy of the West Virginia Division of Tourism. Graphic Design: Marnie Hall. Support: This recording is made possible by The West Virginia Commission for the Arts and by The New York State Council on the Arts, a state agency. Institutional support was provided by Marshall University's College of Fine Arts, Graduate School Research Committee, Office of the Vice President for Academic Affairs. Rights: Copyright © 2001, Leonarda Productions, Inc. All rights reserved. Performing Rights: ASCAP. Music Publisher: Papagena Press, distributed by Theodore Presser Co.